07/2010 Update: After the synagogue’s congregation left in 2005, a new owner had plans to reuse the building as a community arts center. The owner sought local designation for the building, but due to a political battle, the nomination did not pass. When the new owner bought the synagogue, they signed a covenant with the sellers, stating that the sellers had three years to exercise the option of removing the stained-glass windows. The sellers decided to exercise this option, and in 2008 the former congregation starting removing many important architectural features of the synagogue for use in their new place of worship. After an intense legal battle, the new owners were forced to give up the significant windows. While the windows have been removed, the building still remains safe. The new owners are having new windows manufactured in China that replicate the originals as best as possible. They are pursuing tax credits with the intention of restoring the building and are looking for a new use for it. The owners are also pursuing local designation again, after the previously failed attempt. Temple Emanuel is an exuberant limestone and brick building. It features a wealth of Art Deco design elements including a massive octagonal sanctuary with bronze filigree entrance doors and twenty one stained glass panels framed with bold geometric motifs that depict Biblical scenes. Wood pews radiate from the dais, which fronts a marble ark. Finished in 1929, Temple Emanuel symbolized the rising affluence of Paterson’s Jewish community in the 1920s, when the prosperity of silk and other industries in Paterson enabled many Jews to move from downtown where they had settled and built the congregation’s first home to fashionable neighborhoods, such as Eastside Park where Emanuel is located. Largely financed by movie mogul Jacob Fabian, and designed by Paterson architect Fredrick W. Wentworth, Temple Emanuel thrived for roughly 40 years. But by the 1970s Paterson’s industrial base was in decline, and its Jewish community was moving, with the rest of the white middle class, to the suburbs. The Jewish population of Paterson, which numbered 30,000 in the 1940s, included fewer than 1,000 members at the end of the millennium. Facing this stark demographic reality, the congregation merged with another in the 1980s, and in 1995 opted to build a new house of worship in nearby Franklin Lakes. 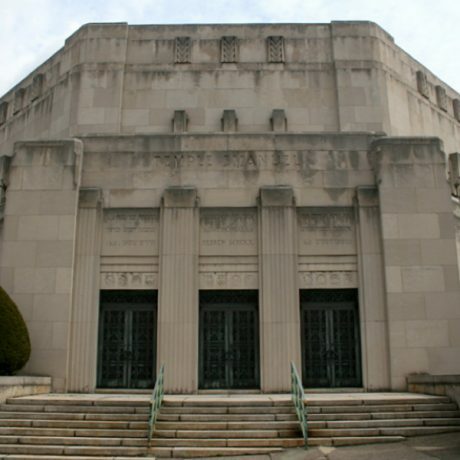 The Temple, a unique Art Deco landmark, closed in 2005, and the building is now vacant; the future of this important treasure of the state’s Jewish history is uncertain. The congregation’s new home, which is scheduled to open in 2008, will incorporate design elements from the Paterson temple, including its original ark and the sanctuary’s stained glass windows. The integrity of the old sanctuary is compromised by the removal of these elements, and any new owner of this large and elegantly appointed facility will face tremendous challenges.